Sutton under Brailes possesses a large village green and is remarkably unspoilt, with old stone dwellings, some beautiful trees and an air of seclusion. The Church2Church walk from St. Thomas a Becket in Sutton under Brailes to St. John’s in Cherington passes the site of a former moated manor house. Up to 1840 the village stood as a detached ‘island’ of Gloucestershire. The Great Elm of Sutton, 150 ft. high came down in 1967 and all that can be seen now is a vast gnarled and knotted reminder of the past grandeur. The village war memorial is to be found on the village green. Cherington and Stourton are now one parish and both are set against the River Stour, not far from where it is joined by Sutton Brook. It is now a long narrow parish crossed from east to west by the River Stour running down from Traitor’s Ford. In fact, Stourton is the first settlement that the river flows through from the source of the river, which is a spring just south of Swalcliffe in Oxfordshire. Stourton was once known as the ‘farm by the river’ and referred to the old former water-mill. Many of the houses are built in the attractive local limestone which came from the quarries at nearby Margett’s Hill. A few date from the 16th and 17th century and a larger number from the early 1700’s. This probably stems from the fact that Cherington was devastated by fire on 27th April 1716. The parish church of St. John, and later the tower were built in the 13th century and features within the church include some fine Early English Gothic windows in the chancel and the lower stages of the bell tower. There is also a figure on the tomb and local tradition suggests it may represent Robert le Fraunkelyn in 1262, who was a local landowner. The Church of St. John sits prettily in a churchyard that is home to over 100 species of wild flowers. The former Wesleyan Methodist Chapel, which is now a private dwelling and is the first property on the left as you arrive at the village of Cherington. The village war memorial is at the top of Featherbed Lane and at the meeting with the road to Stourton. Other notable buildings include Cherington Mill set on the River Stour and now a private dwelling, Cherington House that may date back to the 17th century and the Old Village School (now a private house) which is on the lane to Stourton. 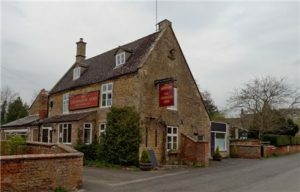 The village public house is called The Cherington Arms and it started life in the late 19th or early 20th century when it was an Ale House. Originally two houses, Garth Cottage and Hallelujah Lodge, ales were sold from a shop in the front of the building. It became a public house where beer could be consumed on the premises about 1946. Today it is a favourite stopping place for the many walkers who pass through the village. Cherington and Stourton Village Hall is on the road to Stourton. Whichford is set in quiet undulating countryside that rises to 800 ft above sea level. For a village the size of Whichford it has many attractions for visitors. These include Whichford Pottery, a family run business making handmade British frostproof flowerpots. Visitors are able to view the flowerpots being made, enjoy the Courtyard Garden and Octagon Gallery and finish-off with refreshments in the Straw Kitchen Café. Nearby Whichford Wood, a beautiful mixed woodland and is a site of special interest. In the summer it is host to a wide variety of wildflowers and in the month of May the area is covered in a carpet of bluebells. Fallow Deer also live within the woods. The former name of the village ‘Wicford’ is recorded in the Doomsday Book and Sir John de Mahun and the Knights of Dunster held the Manors, the Church and the Castle until about 1340. Whichford Castle has long since fallen down and the stones were used to build the east wing of the current Church of St. Michael, but the Moat remains and is still enjoyed by those who like to camp in the grounds. The earthworks and Moat is a ‘Scheduled Ancient Monument’. The parish Church of St. Michael is a beautiful Norman Grade1 Listed Church, light and elegant and with some notable tombs and a Norman Font. The picturesque churchyard is to this day an open place of burial for the local community. It contains carved headstones of great beauty, and dated from the 17th century. The Church in fact forms part of a distinguished ensemble of buildings, being flanked by Whichford House (the former Rectory) on the east and by the picturesque thatched Old House on the west. The Whichford Reading Room is a large room which formed part of the former barn belonging to the Rectory and was generously donated to the village by a local resident. This building now fills the gap left by the absence within the village of a purpose-built village hall. Whichford House, which used to be the Rectory, but is now a wonderfully renovated country house and gardens with its own amphitheatre, is famous for the hosting of many charity events and garden parties. 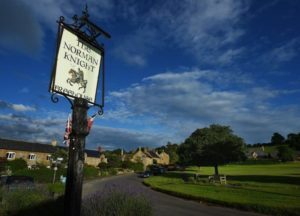 The name of the local public house The Norman Knight, reflects the history of the village and sits opposite the large village green and the central meeting place. The pub has its own micro brewery. This is a very popular stopping-off point for walkers. The village war memorial is close to the village green, at the junction of Ascott Road and Barrets Hill. 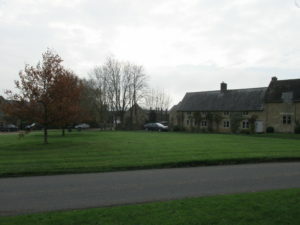 The Old School building, which is now a private residence, is on Ascott Road and overlooks the top of the village green.